The first Steve Göldby Talks Metal show of 2018 featured Anvil's Robb Reiner in conversation about new album, 'Pounding The Pavement', which is released on Friday, 29TH January via Steamhammer/SPV. Robb is in great spirit on the eve of the unleashing of Anvil's seventeenth studio album and as well as hearing the acclaimed drummer's words of wisdom, you can hear tracks from the new album for the very first time. 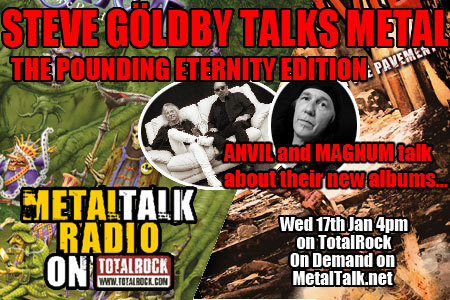 Magnum's Tony Clarkin and Bob Catley also special guest show to talk about their magnificent new album, 'Lost On The Road To Eternity', which is also released on 19th January via Steamhammer/SPV. There's plenty more going on in a packed out show too and part two is available to listen to right here. Click here for part one. You can click the arrow on the right of the players and download a free copy to keep. Click here to pre-order Anvil's 'Pounding The Pavement'. Click here to pre-order Magnum's 'Lost On The Road To Eternity'. Steve Göldby Talks Metal began on 28th December 2016 and today's show is the fifty-first edition. On 29th March 2017, news of the forthcoming Lemmy solo album was broken on the show. Check it out right here. The first ever special guest was AC/DC's Phil Rudd, with many stellar Metal stars appearing since, and it has been broadcast from London, Los Angeles, Hamburg and Glasgow. Plans are afoot to take the show on the road in the future.